When it comes to spectacular visuals in gaming, Creytek is a firm fan-favourite and a new trailer for the CryEngine 3 has left TechRadar agog. 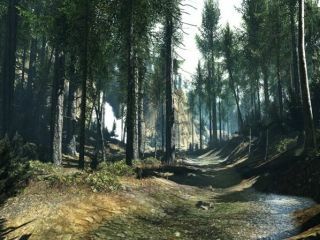 The original CryEngine was the basis of first person shooter Far Cry, moving from a tech demo to a best-selling game. Crytek announced the third incarnation of the CryEngine at the GDC back in March, and it is expected that Crysis 2 will be a game to take advantage. "Having seen the new CryEngine in action, all I can say is 'wow'; it truly is a thing of beauty," said PC Zone editor Ali Wood. "Crysis firmly and confidently set the standard on PC and its testament to CryTek's vision that the latest groundbreaking development tools are set to raise the bar yet again. Whether you're going to be developing using the CryEngine or reaping the fruits as a gamer, there's a lot to get very excited about. The Next Gen suddenly feels a lot closer than it did yesterday." The trailer – focusing on both consoles and PC – is awash with goodies for graphics geeks, and we especially like the drop through the trees early on.